GODE, Ethiopia, May 10 2017 (IPS) - Displaced pastoralists gather around newly arrived drums of brown water as a water truck speeds off to make further deliveries to settlements that have sprung up along the main road running out of Gode, one of the major urban centers in Ethiopia’s Somali region. Looking at the drums’ brackish-looking contents, a government official explains the sediment will soon settle and the water has been treated, making it safe to drink—despite appearances. A total of 58 internally displaced person (IDP) settlements in the region are currently receiving assistance in the form of water trucking and food supplies, according to the government. But 222 sites containing nearly 400,000 displaced individuals were identified in a survey conducted by the International Organization for Migration (IOM) between Nov. and Dec. 2016. 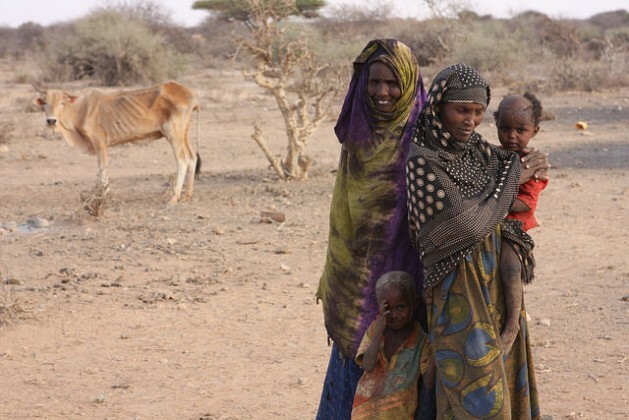 The majority have been forced to move by one of the worst droughts in living memory gripping the Horn of Africa. In South Sudan famine has been declared, while in neighbouring Somalia and Yemen famine is a real possibility. 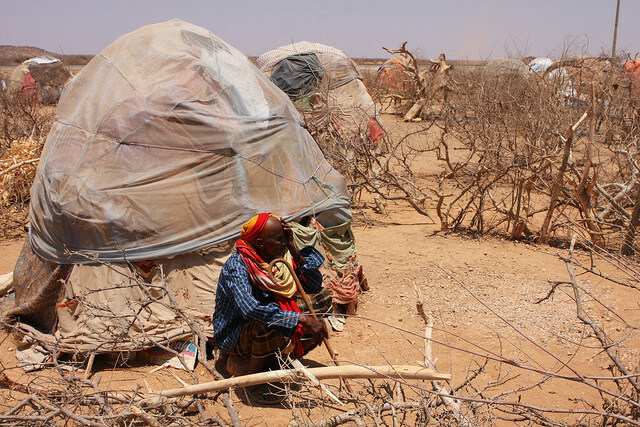 Despite being afflicted by the same climate and failing rains as neighbouring Somalia, the situation in Ethiopia’s Somali region isn’t as dire thanks to it remaining relatively secure and free of conflict. But its drought is inexorably getting more serious. IOM’s most recent IDP numbers represent a doubling of displaced individuals and sites from an earlier survey conducted between Sept. and Oct. 2016. Hence humanitarian workers in the region are increasingly concerned about overstretch, coupled with lack of resources due to the world reeling from successive and protracted crises. The blunt fallout from this is that currently not everyone can be helped—and whether you crossed an international border makes all the difference. In January 2017 the Ethiopian government and humanitarian partners requested 948 million dollars to help 5.6 million drought-affected people, mainly in the southern and eastern parts of the country. 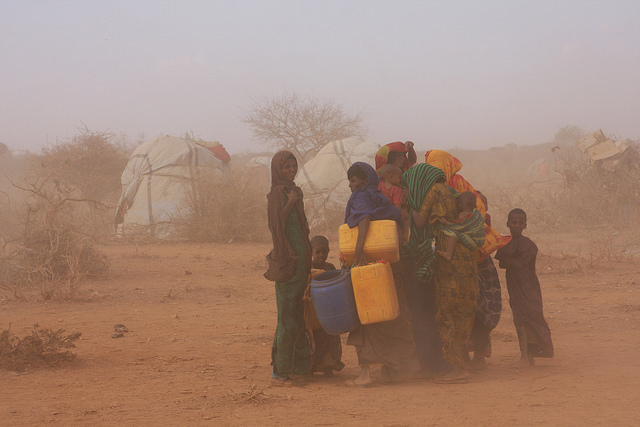 Belated seasonal rains arrived at the start of April in some parts of the Somali region, bringing some relief in terms of access to water and pasture. But that’s scant consolation for displaced pastoralists who don’t have animals left to graze and water. Under the 1951 Refugee Convention, crossing a border entitles refugees to international protection, whereas IDPs remain the responsibility of national governments, often falling through the gaps as a result. In the early 1990s, however, human rights advocates began pushing the issue of IDPs to rectify this mismatch. Nowadays IDPs are much more on the international humanitarian agenda. But IDPs remain a sensitive topic, certainly for national governments, their existence testifying to the likes of internal conflict and crises. Response to Ethiopia’s Drought: A Story of Success or Anguish? The Ethiopian government has far fewer qualms about discussing the estimated 800,000 refugees it hosts. Ethiopia maintains an open-door policy to refugees in marked contrast to strategies of migrant reduction increasingly being adopted in the West. Just outside Dolo Odo, a town at the Somali region’s southern extremity, a few kilometres away from where Ethiopia’s border intersects with Kenya and Somalia, are two enormous refugee camps each housing about 40,000 Somalis, lines of corrugated iron roofs glinting in the sun. Life is far from easy. Refugees complain of headaches and itchy skin due to the pervading heat of 38 – 42 degrees Celsius, and of a recent reduction in their monthly allowance of cereals and grains from 16kg to 13.5kg. But, at the same time, they are guaranteed that ration, along with water, health and education services—none of which are available to IDPs in a settlement on the outskirts of Dolo Odo. Abiyu spoke amid a cluster of women, children and a few old men beside makeshift domed shelters fashioned out of sticks and fabric. Husbands were away either trying to source money from relatives, looking for daily labour in the town, or making charcoal for family use and to sell. “I’ve never seen a drought like this in all my life—during previous droughts some animals would die, but not all of them,” says 80-year-old Abikar Mohammed. 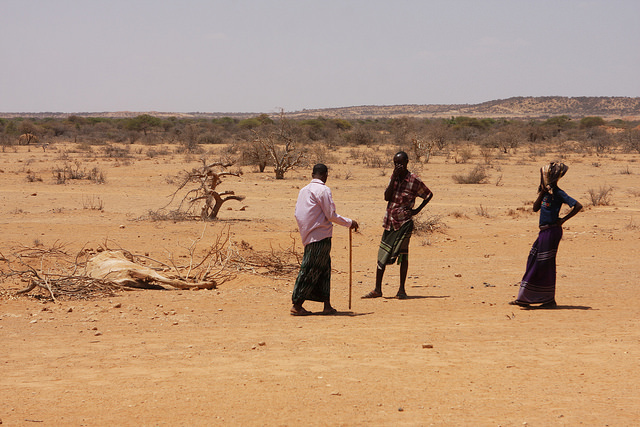 As centres of government administration, commerce, and NGO activity, the likes of Gode and Dollo Ado and their residents appear to be weathering the drought relatively well. But as soon as you leave city limits you begin to spot the animal carcasses littering the landscape, and recognise the smell of carrion in the air. Livestock are the backbone of this region’s economy. 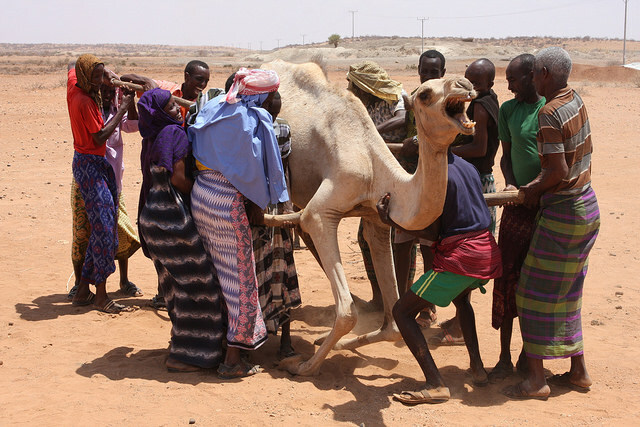 Dryland specialists estimate that pastoralists in southern Ethiopia have lost in excess of 200 million dollars worth of cattle, sheep, goats, camels and equines. And the meat and milk from livestock are the life-support system of pastoralists. “People were surviving from what they could forage to eat or sell but now there is nothing left,” says the anonymous director, who visited a settlement 70km east of Dolo Odo where 650 displaced pastoralist families weren’t receiving aid. The problem with this drought is the pastoralists aren’t the only ones to have spent out their reserves. Last year the Ethiopian government spent an unprecedented 700 million dollars while the international community made up the rest of the 1.8 billion dollars needed to assist more than 10 million people effected by an El Niño-induced drought. Many within the humanitarian community praise Ethiopia’s handling of refugees. But concerns remain, especially when it comes to IDPs. It’s estimated there are more than 696,000 displaced individuals at 456 sites throughout Ethiopia, according to IOM. Security in Ethiopia’s Somali region is one of the strictest in Ethiopia. As a result, the region is relatively safe and peaceful, despite insurgent threats along the border with Somalia. But some rights organizations claim strict restrictions hamper international media and NGOs, making it difficult to accurately gauge the drought’s severity and resultant deaths, as well as constraining trade and movement, thereby exacerbating the crisis further. Certainly, the majority of NGOs appear to exist in a state of perpetual anxiety about talking to media and being kicked out of the region. While no one was willing to go on the record, some NGO workers talk of a disconnect between the federal government in the Ethiopian capital and the semi-autonomous regional government, and of the risks of people starving and mass casualties unless more resources are provided soon. Already late, if as forecast the main spring rains prove sparse, livestock losses could easily double as rangeland resources—pasture and water—won’t regenerate to the required level to support livestock populations through to the short autumn rains. Yet even if resources can be found to cover the current crisis, the increasingly pressing issue remains of how to build capacity and prepare for the future. In the Somali region’s northern Siti zone, IDP camps from droughts in 2015 and 2016 are still full. It takes from 7 to 10 years for herders to rebuild flocks and herds where losses are more than 40 percent, according to research by the International Livestock Research Institute and the UN’s Food and Agriculture Organization (FAO).